Isle Royale is one of the most unusual national parks, not just in Michigan or the Midwest but in the country. It is one of the smallest at only 210 square miles and has one of the lowest numbers of visitors, a mere 17,000. It is the only national park in the country to completely close down in the winter and is also one of the most costly to visit as special transportation is needed to reach the isolated island. 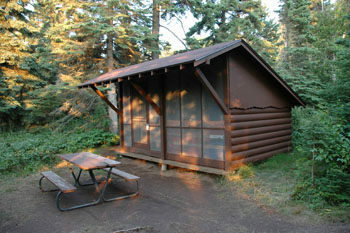 But most of all, Isle Royale has become a paradise for wilderness enthusiasts, particularly backpackers. The 45-mile-long island is laced with 165 miles of foot trails and dotted with backcountry campgrounds. To order Isle Royale National Park: Foot Trails & Water Routes, the 184-page guide to the wilderness island, Click Here. Isle Royale is one of the most unusual national parks, not just in Michigan or the Midwest but in the country. It is one of the smallest at only 210 square miles and has one of the lowest numbers of visitors, a mere 17,000. It is the only national park in the country to completely close down in the winter and is also one of the most costly to visit as special transportation is needed to reach the isolated island. 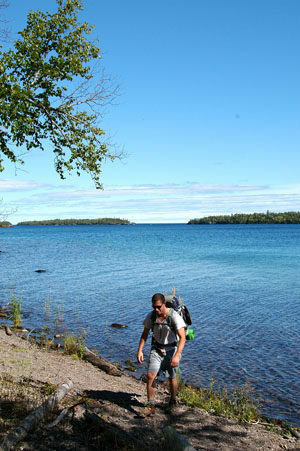 But most of all, Isle Royale has become a paradise for wilderness enthusiasts, particularly backpackers. 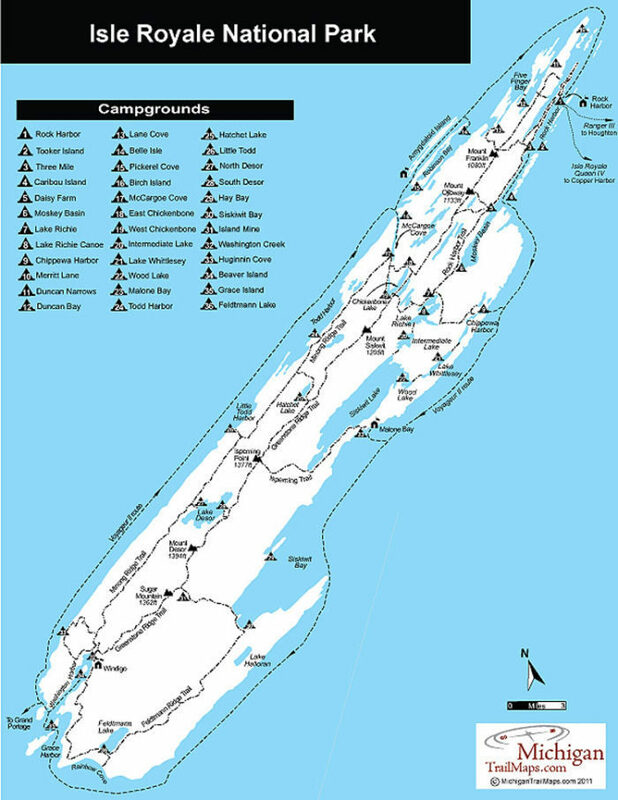 The 45-mile-long island is laced with 165 miles of foot trails and dotted with backcountry campgrounds. The cost of getting there and the excellent opportunity for wilderness adventure is why Isle Royale has one of the longest visitation averages (the amount of time a visitor stays) in the country. At Yellowstone National Park most tourists stay only a few hours. At Isle Royale the average visit is four days. People come to escape at Isle Royale, not to sightsee. And more often than not they take to the trails with a backpack to escape that crush of civilization they left at home. The longest trail in the park and most popular is the Greenstone Ridge Trail, one of Michigan’s classic treks, a five-day walk from one end of the island to the other. Other long trails include the Minong Ridge Trail. This is Michigan’s toughest trail, a six-day walk along the rocky crest of the ridge and across beaver dams. 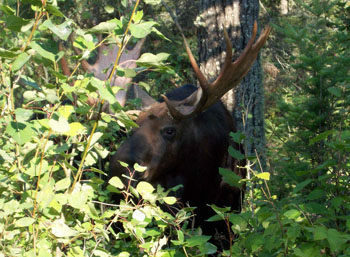 At the west end of the Island there is the Feldtmann Ridge Trail is a three-day walk out where the highlight for many who follow the loop is spotting a moose. Other trails at the park are shorter and often combined to form a variety of overnight treks out of either Rock Harbor, the entry port at the east end of the Island, or Windigo, the entry port at the west end. These include Rock Harbor and Lake Richie Trails, Indian Portage Trail, Hatchet Lake Trail, Island Mine Trail and Mount Franklin Trail. Still other trails are suitable dayhikes from either port of entry. Ferries from Michigan depart from Houghton or Copper Harbor and arrive at Rock Harbor where there is a lodge, housekeeping units and a campground as well as transportation to other parks of the Island. In Rock Harbor visitors can spend an afternoon hiking Tobin Harbor Trail, Stoll Trail or Lookout Louise Trail. Ferries from Minnesota depart from Grand Portage and arrive at Windigo where there is a campground and visitor’s center. Dayhikes from the west end include Huginnin Cove Loop, treks to Grace Creek and Minong Ridge Overlooks and Windigo Nature Trail. Along with campgrounds or accommodations, both Rock Harbor and Windigo have small stores, showers, ranger stations and transportation to other parts of the island, aboard the Voyageur II. The Minnesota-based ferry can also return backpackers to the port they arrived at after their trek across Isle Royale. But keep in mind that you must come prepared and in good walking shape if contemplating a multi-day backpacking adventure. This is not a place to be breaking in your new hiking boots. All backpackers must arrive with a water filter and a small stove as fires are not allow in most of the park. You should also arrive with a light pack and lots of moleskin for unexpected blisters. Isle Royale is not mountainous but it is composed of long ridges and on all three of these trails at times there will be considerable up-and-down hiking. Small price to pay to escape the mundane routines at home. There are small stores in Rock Harbor and Windigo that carry many items, ranging from freeze-dried dinners and trail munches to fishing tackle, pots and day packs. But the quantities are limited and often run out until the next boat arrives while the prices are higher than on the mainland. Those ending their trek at Rock Harbor have several ways of easing themselves back into civilization. Shower tokens, clean towel, and bar of soap can be purchased at the camp store. After 6 days of mac-and-cheese, you might want to have dinner at the lodge dining room. Or maybe just a cold beer on the adjacent outdoor deck. Some backpackers even like to book a room for their final night at Rock Harbor, either at the lodge or in one of the housekeeping units that can be shared by six people and feature small kitchenettes. Reservations are strongly recommended, but visitors can occasionally get last-minute accommodations because of cancellations. For reservations, contact the park concessionaire, Forever Resorts (866-644-2003 or 906-337-4993 in summer; www.isleroyaleresort.com). Canoes are also available at Rock Harbor and Windigo for paddling in the local area. The rates are based on a half- or full-day rental and include paddles and life jackets. At Rock Harbor Lodge you can also rent a rowboat and 9.5-horsepower motor. Inquire at the camp stores about rentals. Three ferries and an air service company provide transportation to the Island and advanced reservations are urged on any of them from late June to late August. The 165-foot Ranger III is operated by the National Park Service and travels from Houghton to Rock Harbor on Tuesdays and Fridays, departing Houghton at 9:00 a.m. It returns from Isle Royale on Wednesdays and Saturdays, departing Rock Harbor at 9:00 a.m. for the six-hour trip back to Houghton. You can cut the sailing time by 1.5 hours by departing from Copper Harbor, home to the 100-foot Isle Royale Queen IV. From mid-June to July the ship leaves Copper leaves Copper Harbor at 8 a.m. daily except Wednesday and Sunday and departs Rock Harbor the same day at 2:45 p.m. 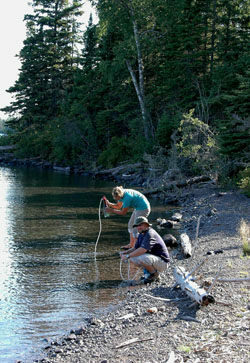 In July it departs Copper Harbor daily except Wednesday and in August it makes the round-trip run to Isle Royale daily. The Copper Harbor ferry also runs in May and September on a reduced schedule. Two ferries also depart from Grand Portage for the 2.5-hour trip to the park. Both stop at Windigo, the ranger station at the western end of the Island. From mid-June to early September the 65-foot Seahunter departs Wednesday, Friday and Saturday from Grand Portage at 8:30 A.M. (Central Daylight Time) and then returns from Windigo the same day at 2 P.M . (Central Daylight Time). From mid-July to mid-August it also sails on Thursday and Sunday at the same times. The 63-foot Voyageur II runs from early May to late October. From late May to late September, it departs Grand Portage Monday, Wednesday and Saturday at 7:30 A.M. (Central Daylight Time), stops at Windigo, and overnights at Rock Harbor Lodge. The following day, Tuesday, Thursday and Sunday, it departs from Rock Harbor at 8 A.M. (Central Daylight Time) for Windigo and Grand Portage. For most of May the ship departs Grand Portage only on Wednesday and Saturday and mid-September through mid-October only on Wednesday, Saturday and Sunday. Regularly scheduled seaplane service is available out of Houghton for either Windigo or Rock Harbor Lodge. Royale Air Service provides on-demand service from mid-May to mid-September, often flying to the park Monday through Saturday during the summer. Flights depart from the Houghton County Airport and land in the protected bays at Windigo and Rock Harbor. The amphibious Cessna 206 carries up to four passengers along with 50 pounds of gear per person. Many backpackers take advantage of the intra-Island service by taking the plane to Windigo, hiking to Rock Harbor Lodge, and returning on the Ranger III. Advanced reservations are urged for all three ferries from late June to late August. For reservations for the Ranger III contact Isle Royale National Park (906-482-0984; www.nps.gov/isro). For the Isle Royale Queen IV contact Isle Royale Line (906-289-4437; www.isleroyale.com), for the Voyageur II or Seahunter contact Grand Portage – Isle Royale Transportation Line (651-653-5872, 888-746-2305; www.isleroyaleboats.com), and for seaplane transport contact Royale Air Service (218-721-0405, 877-359-4753; www.royaleairservice.com).